A quest to return to the age of my great-grandmother. Now, don’t get me wrong. I am the first to admit I love my modern day conveniences. I am so thankful for my washer, dryer, refrigerator, the hot water that instantly rushes out of the tap, my beloved computer that allows me to connect with you, AC (thank you, Lord), and even my iPhone. I am thankful I live in such a day and age. But there is a part of me that longs for the age of my great-grandmother. Returning to days of yes, hard work, but also simplicity. An age of growing your own food, herbs lined outside the kitchen window, lard in homemade pie crusts, raising backyard chickens, leftover flour sprinkled across the kitchen counter, and the smell of fresh baked bread coming from a warm oven. There were hard times back then, but life, in my mind, seems as though it was simplified, valued, and the home-life cherished and real food praised and celebrated. I realize I probably wouldn’t last more than a week without my washing machine, but a girl can dream. 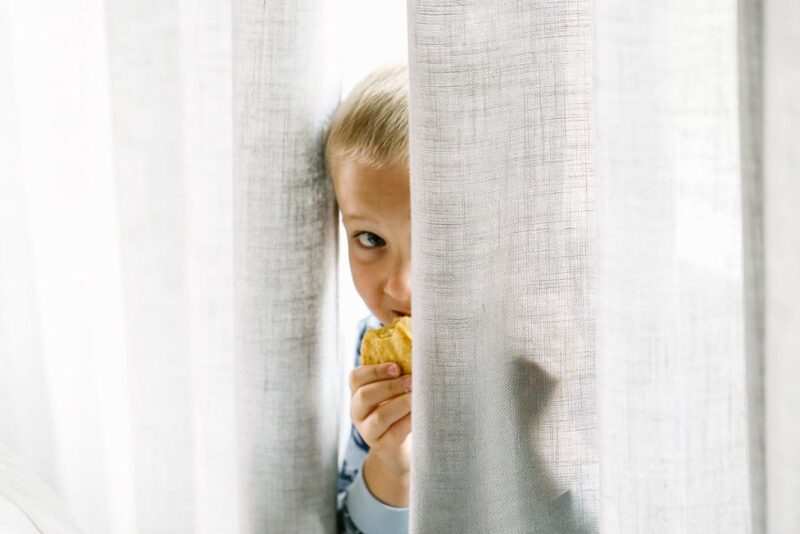 When I think of great-grandma’s day, my mind is always drawn to biscuits. I’m not talking about those tubes filled with a white doughy substance that last months to years on the store shelves. What? Real dough actually lasts that long? 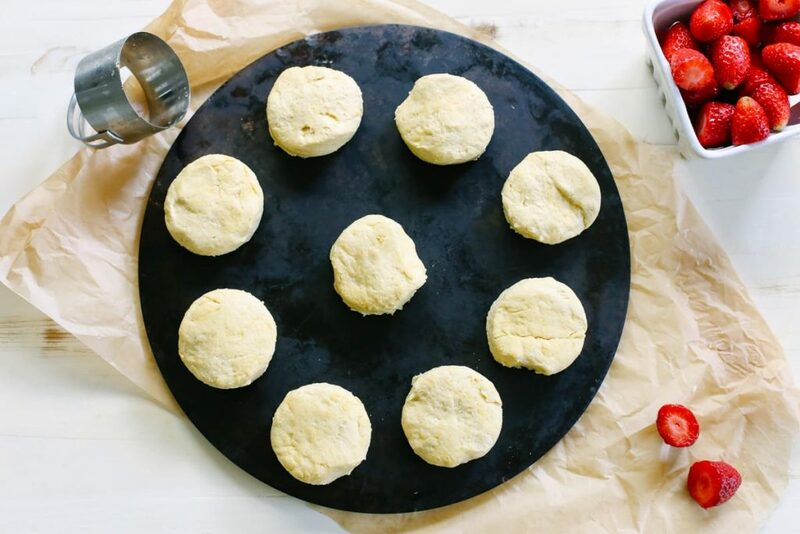 I am talking about the simplicity of real homemade biscuits from scratch. 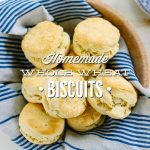 Something about the simplicity and realness of buttery wheat biscuits paints a picture in my mind of a homemaker in the kitchen. A floral apron around her waist, children playing at her feet, chickens at the back door, and fresh veggies and herbs growing in the backyard ready to be picked and enjoyed. These biscuits are a representation of simpler times. A buttery, flaky from scratch biscuit. A biscuit great-grandma would be proud of make and serve to nourish her family. The very word simplicity can be summarized in these biscuits. The simple ingredients combine together to create a biscuit that melts-in-your-mouth. Literally! I know you may be leery of homemade biscuits. I understand. I have made countless biscuits over the years all resulting in perfect hockey pucks, far from the flaky buttery goodness I desired. A lot of wasted flour, milk, and butter. Just for the record, I hate wasting good butter! It really seems like a crime! These biscuits, are a far cry from hockey pucks. They literally flake and melt-in-your-mouth! 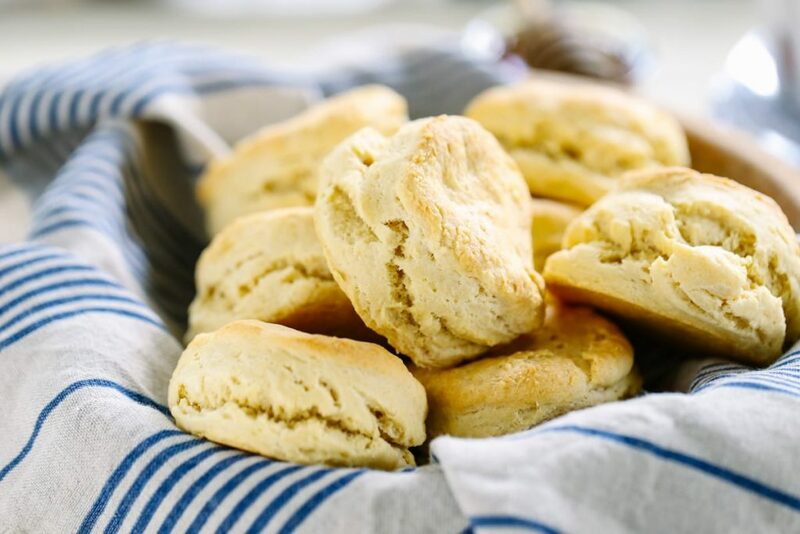 The deliciousness of a biscuit great grandma would be proud to serve that takes only minutes to create and leaves your family satisfied with buttery, flaky goodness. Measure out the flour into a large bowl. Add in all the cubed butter. With your hands or a pastry cutter, cut the butter into the flour. You want the butter to look like coarse crumbs mixed in the flour. Pour 1 cup whole milk over the butter/flour mixture. Add in the acidic medium. I choose to use Apple Cider Vinegar. You can also use lemon juice or whey. Mix together the butter/flour mixture, milk, and Apple Cider Vinegar. Do NOT over mix. Mix just enough to get the flour/butter mixture nice and wet. Cover the bowl with a towel and let sit for 12 hours. Add in the salt and baking powder. If you are using herbs, mix in the 1/4 of chopped fresh herbs. Mix just enough to incorporate the dry ingredients in the wet flour mixture. You do NOT want to over mix! Scoop the dough out of the bowl and drop on a floured surface. Dust the top of the dough with flour. Roll out the dough with a rolling pin. You want a long rectangular shape. Fold the dough in half, lengthwise and gently press together. Using a biscuit cutter cut out individual biscuits. Place on a baking sheet or stone. 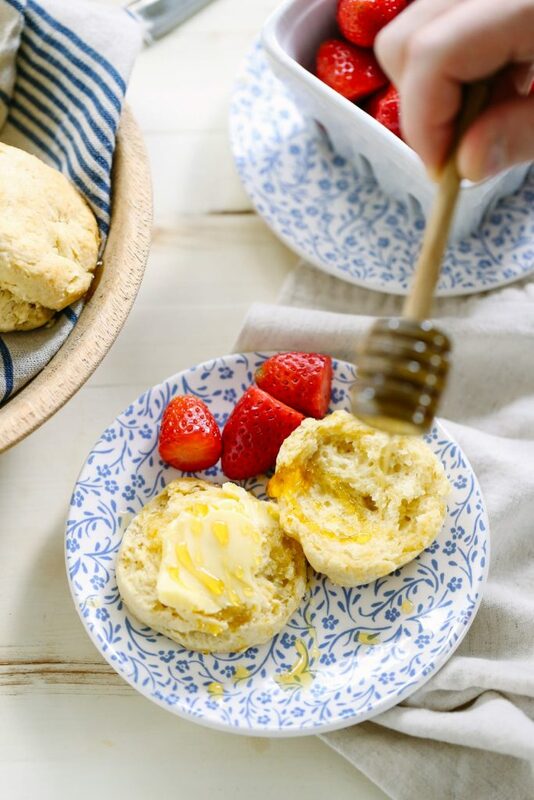 Remove the warm biscuits from the oven and serve warm with butter, yes, more butter and honey and whatever your heart desires. 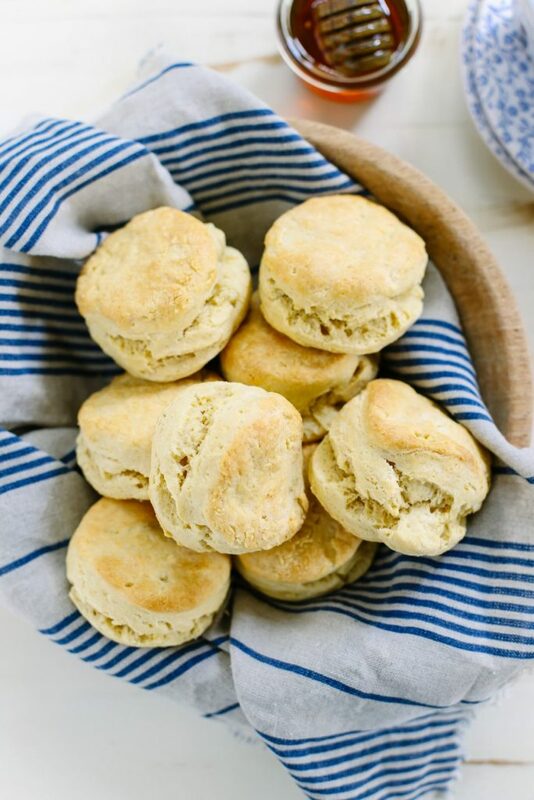 You don't have to let these rest overnight, if you don't want to soak the biscuits or you're using einkorn flour. Simply mix the biscuits and bake. To Freeze: Place the uncooked, cut-out biscuit dough on a cookie sheet. Freeze the raw biscuits until frozen (about 30 minutes-1 hour). Once frozen, place the biscuits in a freezer-safe bag or container. When you’re ready to cook a biscuit, follow the cooking directions in the recipe above. Allow for 2-4 extra minutes of baking time. 2015 Flour Update: I use einkorn flour almost exclusively these days. For an einkorn version, use 2 2/3 cup einkorn flour with the remaining ingredients. No soaking is necessary for einkorn, so simply combine the dry ingredients and butter (this may also be done in the food processor), then the wet ingredients. Mix just until the dough is wet. Einkorn is the flour pictured in this recipe (the photos have been updated since the original recipe posting in 2013). Einkorn looks and tastes similar to white flour, so it’s the perfect healthy flour to use when making pizza dough. Einkorn is sold in some health food stores and online. Einkorn doesn’t like to be kneaded or overworked, so you’ll want to stop kneading einkorn pizza dough once the flour is combined into the dough. If you continue to knead the dough, it will “deconstruct” and turn into a mushy dough that’s impossible to handle. New to your blog – loving it! I’d love to try these biscuits, but would it work with coconut milk? Thanks for sharing all your homemade goodies! I believe it would work. I have made them with water too. So glad to hear! I just made more today to freeze for this week’s breakfasts! Pastured bacon, egg, and cheese biscuits are in order. How many biscuits does this usually make?! Depending on the size you cut them, I usually get around 10. I double the recipe often to make plenty for the freezer. Hi morning saver! Can I use white whole wheat flour? Hi :). You can try it. The pastry flour is lighter and creates a flaky biscuit. I think the white whole wheat would work. They may just be a bit more dense. Whenever I make biscuits, I shape the dough into a rectangle and use a pizza cutter to cut it lengthwise once, then cut them into small rectangles crosswise. Saves time and still are attractive. You will get a fluffier biscuit if you fold it 10-12 times before cutting it. I did so with this recipe and I got good results. This technique is best used with recipes that use baking powder. I just used regular whole wheat flour and had to double the amount of liquid to get the dough just right. That made me worry about how the biscuits would bake, but that was silly, since they came out perfectly. My parents and I are gobbling them all up! Thank you so much for the recipe! Wow. What a wonderful compliment. Thank you so much for sharing. I’m so glad you like them. They are a regular around our house. Do you use unsalted or salted butter? Can’t wait to try these! Hi Mary, I use salted Kerrygold butter the majority of time. Try cutting them into squares with a pizza wheel/cutter. No scraps. Great idea, Barbara. Thanks for sharing. Hi Linda, Just like a Pillsbury biscuit, pop them right from the freezer in the oven. No need to defrost first :). Do you think these could work as the topping for a chicken pot pie, in lieu of pie crust? Hi Danielle, I haven’t tried using the dough to top on chicken pot pie, but a reader recently shared she does. She raved about the results, so they must work well. I love all your recipes and am excited about introducing more whole foods in our diet. My sons and I can’t handle dairy, do you think almond milk or coconut milk would be a good replacement in this recipe? Hi Sarah, Thank you so much, glad you like all the recipes :). I’ve never tried almond or coconut milk in this recipe, but I think they would be great. You could also use water, although they will not be as “rich”. Enjoy! I’d love to hear how the milk alternative works. Thank you again for this awesome soaked wheat recipe. I made cinnamon rolls this morning with the dough and had lots of compliments from my guests. I also love your soaked whole wheat bread recipe! I tried a recipe from another blog for comparison and I found your recipe was superior in taste and texture and much simpler to make! Thank you so much for sharing, Bethany! I’m so glad the cinnamon rolls came out so great–I need to be a guest in your home ;). I stopped soaking our grains due to time restraints this past year, but I look forward to returning to this wonderful practice in the future! When you use the einkorn flour do you still need to leave the batter out for 12 hours? I am a little confused by the update. Btw the original recipe worked great! 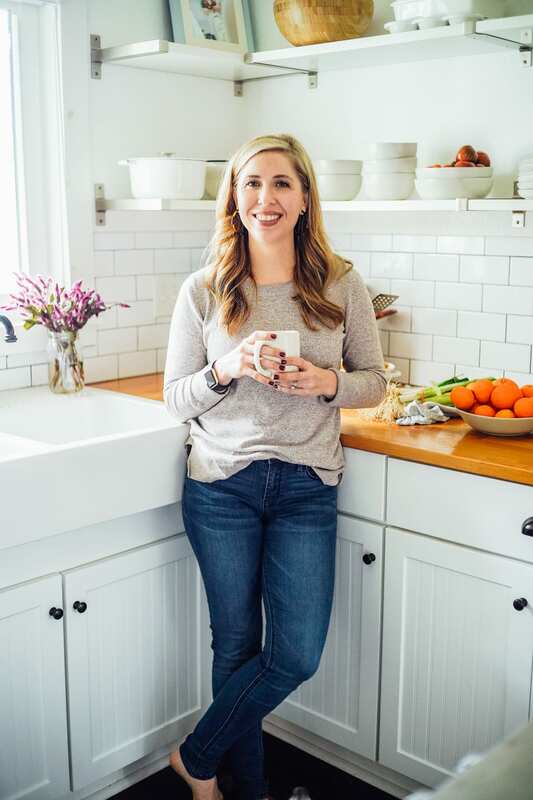 Hey Jennifer, I don’t soak the einkorn, which is why I’ve made the switch for this recipe. I don’t have a ton of time these days for soaking, so einkorn is a perfect solution. Einkorn doesn’t perform very well when it’s been soaked, from my experience. I’m making these and my mixture for soaking is quite wet, like a brownie batter! Should it be more like a biscuit dough before the soak? Hey Jackie, Once all the ingredients are added the dough should be like biscuit dough–just a bit stickier than store-bought dough. Are you using the whole wheat flour, or einkorn? You may need to add more flour if the dough is still very wet before pressing the dough out and cutting. I have a question about these steps. I doubled my recipe and followed your directions up to the step of letting the dough rest for 12 hours. The dough was really thick at that time, and then after resting, your steps say to then add in the salt and baking powder? Needless to say it was difficult to stir in salt and baking powder to a dough mixture already thickened that had been resting for 12 hours as well. So my biscuits did turn our hard and more puck like. Can you clarify this part of the instructions/process for me? Thank you. Hey Allie, I’m sorry to hear the biscuits were really hard. There is always the possibility that too much flour was added. When it comes to volume measurements versus weight (which I haven’t calculated the weight measurements for these yet), that’s always a possibility. Biscuit dough should be slightly wet and a bit “sticky,” but it does take a bit of muscle to add the salt and baking powder–they can’t be added to the soaking process. Did you use whole wheat pastry flour? If not, the flour may also have been the issue. Pastry flour is the lightest form of wheat flour available, which helps with the soft and flaky texture. I love these biscuts!! i have made them a couple times now and they always turn out great. One question i have though, whenever i make them i have to add quite a bit of additional flour after i have mixed everything in to make it workable and then they always take more than ten minutes. Is this normal or should i be doing something differently? Also my biscuts don`t turn out very “tall” how thick are you rolling the dough, and do you just fold it once? Hey Michaela, I apologize for my late response. It may take a bit more flour to make them workable, particularly if you’re using einkorn (or even wheat)–they shouldn’t be worked too much, so maybe just try adding a couple more tablespoons of flour to the initial recipe amount–this may help with the rising issue, too. The dough should be pretty sticky, but also workable. I roll the dough pretty thick (maybe up to the first wrinkles past my fingernail, or a bit higher–I know, very precise measurement here, lol) and then fold the dough over itself once. The baking powder is what makes the biscuit rise–so possibly try a different baking powder. I would like to make – the bread was yummy! 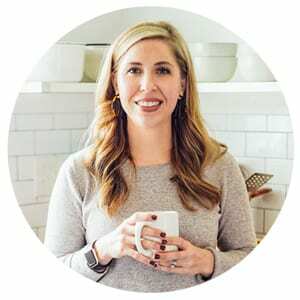 Hey Dawn, The original recipe calls for soaking overnight (a traditional technique), but you can also simply mix the ingredients and bake ASAP. Hi Kristin! I’m making these for our dinner tonight but with the einkorn flour substitution. Do I leave out the apple cider vinegar since the soaking isn’t necessary with einkorn or should that still be included when I combine the wet ingredients? Thanks! Hey Karli, Yes, that’s correct! Leave out the vinegar :). I am just about to put the ingredients together using Bob’s Red Mill whole wheat pastry flour… is it necessary to soak for 12 hours? I picked a bad time to start at 10 am ha! What would happen if I started baking before the 12 hours or after; what is the purpose of soaking? Thanks so much, I am SO excited for these, especially after reading the amazing reviews and comments! Hey Alexa, You don’t have to soak the flour. The soaking process breaks down the phytic acid in the wheat, making it easier to digest. So it’s just a digestion thing. It also softens the dough a bit. 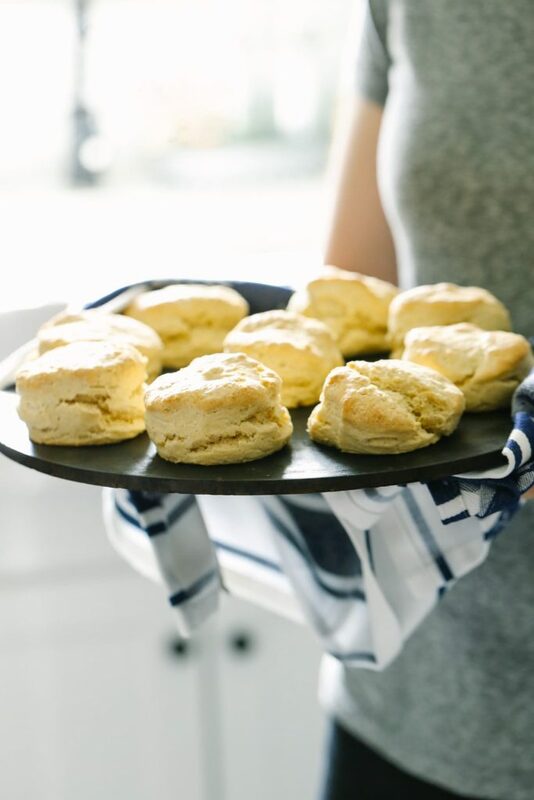 You can definitely make the biscuits without soaking. Enjoy!